Forgiving My Daughter’s Killer by Kate Grosmaire – wow! What a powerful read about an extraordinary couple who not only read the scriptures but lived them. Kate and Andy Grosmaire are an ordinary couple with huge hearts for God and for people. They live out their faith. When Kate and Andy’s daughter Ann was shot by her boyfriend Conor, their ordinary day became the start of a living nightmare. Palm Sunday 2010 will be forever in their minds. As they journeyed to the hospital, Kate and Andy had no idea what awaited them. 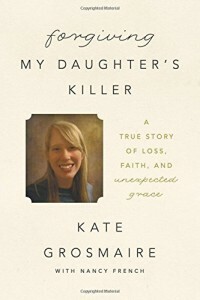 The book written by Kate describes their feelings in the aftermath of the shooting, and the subsequent months. It is a journey of forgiveness. Forgiveness that began instantly as Kate prayed “and be with Conor too.” Kate realised that not only did they and Ann need God, Conor needed Him too. Kate Grosmaire describes the hospital room. In spite of the tragedy there were “glimpses of God.” God was present with them. “I strongly felt God sharing in my grief.” God is not a distant God. He shares our pain and our losses. God walks alongside us at all times. The community rallied around the Grosmaires but they were not the only parents to lose a child that day. The McBrides lost their son Conor to prison but “as the McBrides were losing their son in a real way, they were being isolated by their community.” The McBrides had no one to turn to so they turned to Andy and Kate. Only by God’s grace was Kate able to connect with Michael (Conor’s Dad). “God’s grace moved me across the room, and my arms reached out and hugged him.” There are times in life when we come to the end of ourselves and need God’s strength to help us. With this process of forgiveness came a new bond for Andy and Kate with both Conor and his parents. Kate decided that “we cannot define him (Conor) by that one moment.” If they defined Conor as a ‘murderer’ then they would have to define Ann as a ‘victim’ and she was so much more than that. Palm Sunday 2010 was a tragic event that had far reaching consequences. Kate Grosmaire writes about a process called restorative justice. It had never happened before in Tallassee but the Grosmaires and the McBrides pursued this route. They had to push for it to happen as they all felt that a trial was not the way forward. At the end of the book there is a whole section on forgiveness – what it is and what it is not. There is also an interview with Conor. Forgiving My Daughter’s Killer was an incredibly powerful and emotional read. The Grosmaires are amazing. I do not know if I could have been as strong or as faithful and obedient as they were. Forgiving My Daughter’s Killer is a very raw and honest read. It will make you think and it will make you examine your own faith. I can highly recommend it. God bless you Andy and Kate. Thank you for sharing your story.